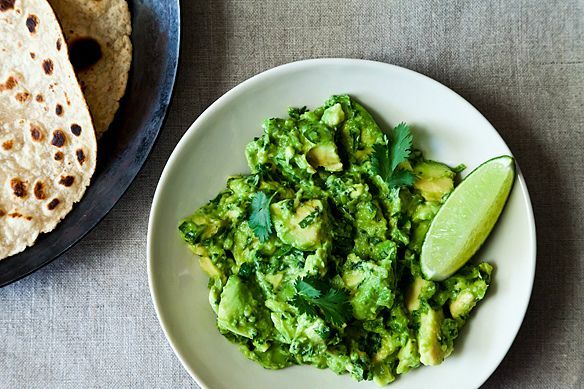 Today: How to make an even better guacamole. It's pretty hard to make a bad guacamole. Unless you use an unyielding avocado or a colorless tomato, people will always like you more if you bring guacamole to the party. By willingly tasting as you go (and obviously that is what you will be doing), there are endless ways to land on your own best combination of tang, salt, and spice. But who says you can't learn to make an even better one? Can you be even more popular at the party? No one, and yes. 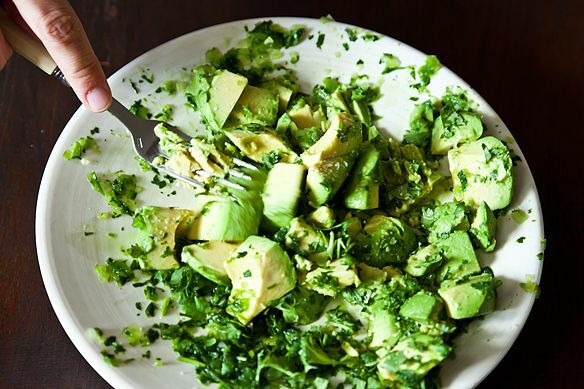 The Chunk: You chop up onion, chile, cilantro, maybe garlic, maybe tomato, then stir the avocado all around it, so you stumble on crunches of sweet or hot as you go. It's a bit like you've hidden pico de gallo in your otherwise plain avocado. The Blend (a.k.a. The Tableside): You start by pummeling your flavorful ingredients (in a molcajete, if you're really serious), then grind the avocado in too. Everything usually becomes one creamy, well-blended mass. Then chips go in it. Both are good; both disappear quickly. I'm still going to tell you about a third method, one that I heard about from both FOOD52er LLStone and Caitlin Freeman of Blue Bottle Coffee. Freeman called it "the best guacamole I’ve had in my life (from my hands or the hands of any other)." It skates between The Chunk and The Blend, and it might change the way you think about guacamole. It's in his Classic Guacamole that Santibañez takes the traditional ideal for guacamole from his native Mexico and defines it for modern American kitchens, using everyday tools. Amanda's pretty, but rather impractical, mortar and pestle might not look like your everyday tools -- don't worry, you have other options. 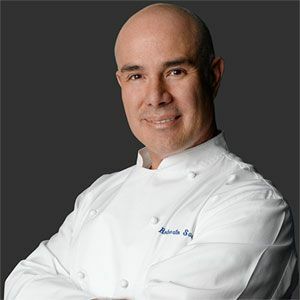 What Santibañez wants cooks to realize, he told me, is this: "There is a very important textural thing to guacamole -- we never really mush up the avocado. You want to feel everything." In his recipe, the ingredients are what you'd expect; he just handles them differently. 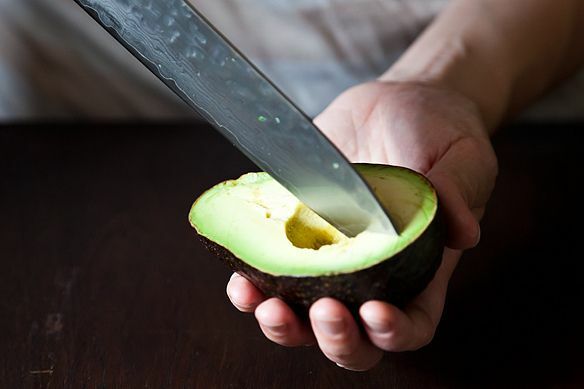 With a mortar and pestle, or the side of a big knife, or even a fork, he first pulverizes chile, onion, cilantro, and salt into a bright green slurry, then gently folds in cubed avocado. He crushes only enough of the avocado to warrant it consideration as a dip rather than a salad, but leaves the rest of the cubes intact, bathing them in the vividly flavored chile sauce, "a bit like salad properly dressed in vinaigrette," he writes. 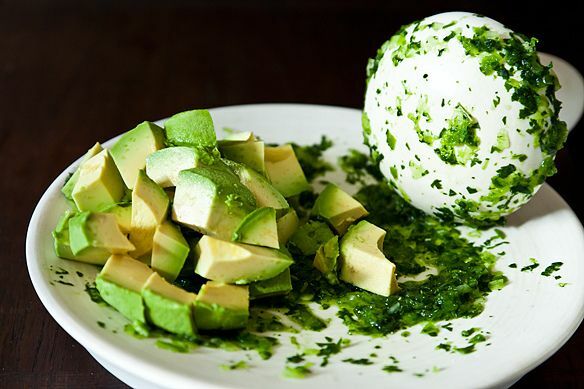 More chopped cilantro and (optional) lime juice finish it off, and you have a dip that ignites as it first hits your tongue, then cools as you break through each lump of clean, creamy avocado. The star gets to shine alone, but still party with its friends. the guacamole by mr. santibanez is so easy to do. easy to find ingredients too. This looks wonderful. My sister-in-law uses a similar method. She too is from Mexico so that goes with the title "True Mexican cooking". She also adds cucumber, which, to me, sends it to another level. I just made this and it was delicious! I used only jalapeno though and it wasn't spicy enough - next time will use half jalapeno and half serano. I also added a leaf of kale chopped as whole foods adds kale to their guac and we like it. Easy recipe - will definitely make many, many more times! Thanks Kristen!!! I'm willing to give this a go; as of today, the best guacamole I've had was beachside in Sayulita, Mexico. Sounds amazing, what if we didn't compare, just appreciated both for individuality? Si, Abbyarnold, Add Pico de Gallo made fresh in place of the onion. Pico de Gallo is white onion, tomatoes (seeds removed), garlic, cilantro and salt. Chop tomato and onion to pea size, in equal amounts. 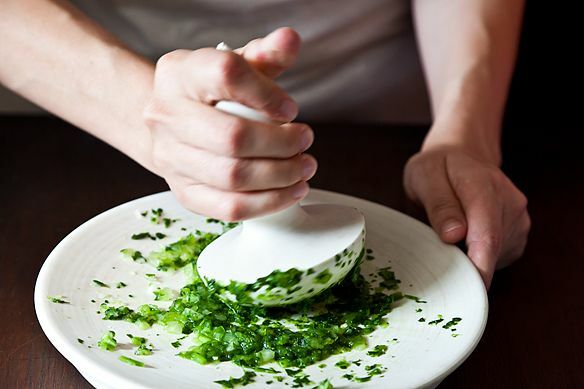 Add fine dice of garlic, salt and cilantro to your own taste. another trick is to use your favorite bottle of hot sauce to adjust the heat. Much more accurate than predicting the chili heat. Just add, taste and repeat. Plus, it might be the last time you get to taste the guac! Try adding a little chopped broccoli and cauliflower.That's right: chopped broccoli and cauliflower. They add texture no one's ever guessed them as ingredients in my guacamole. Also, for some people cilantro tastes like soap, so I don't use it. A trick I learned from my brother who learned to make guacamole in a Mexican border town. 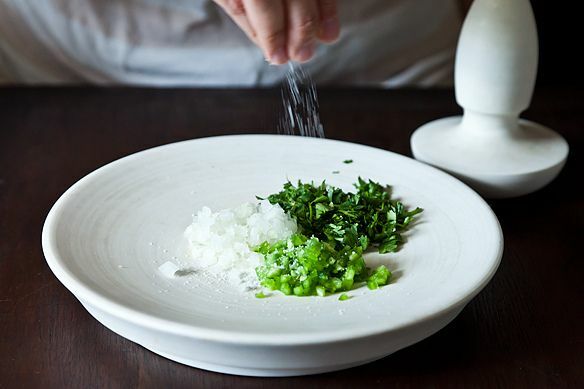 Deborah Madison suggests a similar method of a paste- like concoction with the cilantro, serrano chile, salt, and onion in Vegetarian Cooking for everyone. PS- use the lime juice on this mixture first, makes the onions taste better, sort of like quick pickling. Perfecto! This is the exact recipe that I serve at my winery's tasting room. Not to mention that it pairs absolutely perfectly with our incredible Sauvignon Blanc!!! So Zesty yet has tropical notes of Kiwi, pear and citrus! YUM!! I also add sometimes a bit of Serrano Pepper and some garlic when I am in the mood!! If you can find this wineries wine you should buy it! Especially the reds. They are incredible. my white onion instead of chopping it. The resulting onion juice adds another dimension. Originally discovered this guac during the Piglet tourney. Caitlin's words: "the best guacamole I’ve had in my life" sent me straight to the kitchen. She is right. btw: Caitlin also makes mean sweets. Do not miss them when you visit Blue Bottle. I do too! I love learning about the mother sauces of Mexico, and they are delicious. After reading this recipe, it is clear that I have been making my guacamole wrong all this time. Sadly, I have mishandled many an avocado with my "mushing technique." I look forward to changing my ways and in turn, becoming the most popular guest at the next potluck dinner party. This is very similar to how we make it. But often I use Ortega mild green chiles, and I use more lime. I'm particular about it and garlic and cumin are big no no's. I would be very sad to see completely creamed avo and chunks in salsa are just avocado salsa, not guac. This is the recipe I have used since I bought the book Truly Mexican after The Piglet this year. It is scrumptious. I do sometimes add green (jalapeno) Tabasco. I always add a little cumin in addition to the other ingredients mentioned. 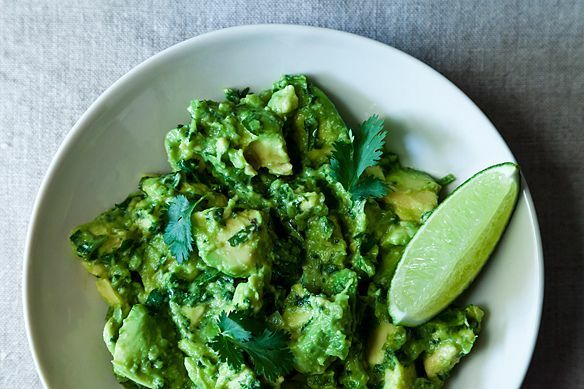 I think it adds a wonderful smokiness to the sharper and pungent flavors of chile and cilantro and use lemon juice instead of lime for brightness. Delicious. This is exactly the way our favorite restaurant here in our Mexican beach community makes guacamole - at your table, using a molcajete. 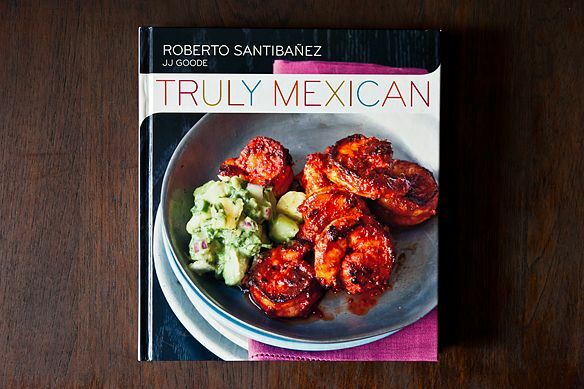 As the author claims, it is "truly Mexican." We also patronize a few places that add chopped cucumber to their guacamole - that is also very good. Thanks for sharing this delicious and simple recipe. Isn't it amazing so few ingredients and yet so delicious. As always, beautifully described Kristen! Love your posts. 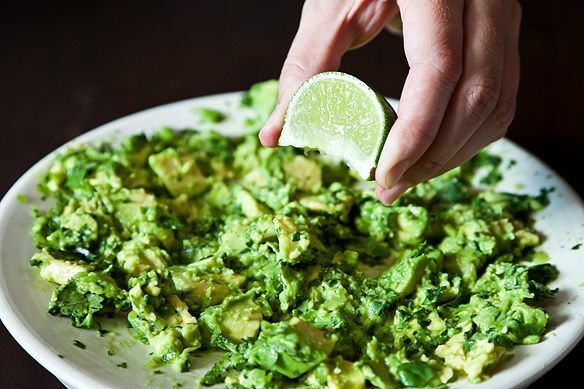 While this sounds wonderful, I must confess that ever since my trip to El Salvador, I now always add chopped hard boiled eggs and garlic to my guacamole, giving an unexpected creaminess and depth to the flavor. This comment is five years late :) but you should share your recipe! I'd give it a try.